Hawaiian Postscript – OK, OK I Didn’t Work the WHOLE Time! If you’re reading this from Facebook, we’d like to ask you to ‘subscribe’ to our blog – it’s free and easy, just fill in the blank at the right hand side of this article (Follow Blog on Email) with your email address, go to your email and ‘confirm’ – that’s it. You’ll then have our weekly blog come directly to your email. If you’ve already subscribed . . . send the link to a friend and Thank You! For those who may have questioned my veracity regarding the story on my recent trip to Hawaii (I Had To Go To Hawaii To WORK! – A Picture Story), in the interest of full disclosure, I must admit that while the conference I attended did go from Thursday – Saturday, the vendors (and I’m a virtual vending machine) were not included in Saturday’s agenda. Since I was wasn’t sentenced to spend five hours on a ‘red eye’ strapped into the last row of seats for my flight home until 9:00 pm Saturday, I had the whole day to explore Kaua’i. On Friday evening, while not sitting at one of those tiki bars not having one of those umbrella drinks, I struck up a conversation with a young man who had just returned from a hike. I asked him to tell me about it. He had me at “at the end is this beautiful waterfall.” My Saturday was planned. I took the Kuhio Highway – the term ‘Highway’ here is used in the most colloquial sense – it is a narrow, two-lane road, when it doesn’t cross a river and go down to a one-lane bridge, that winds past the posh resort, homes and golf courses of Princeville and then through the quaint and euphonious town of Hanalei until it just ends. I think it was the first highway I’d driven on that just came to a dead-end. I parked. 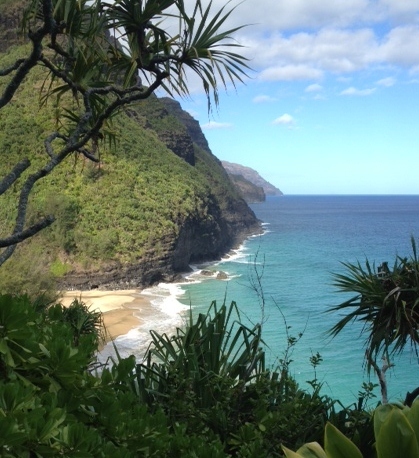 I was at Ke’e Beach in Haena State Park, on the Na Pali coast, trailhead for the hike to Hanakapi’ai Falls. This was the setting for Bali Hai in the movie South Pacific; beautiful doesn’t even begin to describe it. So one false step could send you down the cliff, careening off lava rock into a watery grave several hundred feet below; but you will have died in a most beautiful place, so you’d have that going for you. It was about mid-morning when I reach Hanakapi’ai Beach and it was becoming quite warm; I considered a quick dip in the ocean (I read the ‘Hazard Warning’ after I did the hike) when I noticed a wooden sign stuck in the sand at the entrance to the beach. In case you can’t read it, it says, “BEACH WARNING! 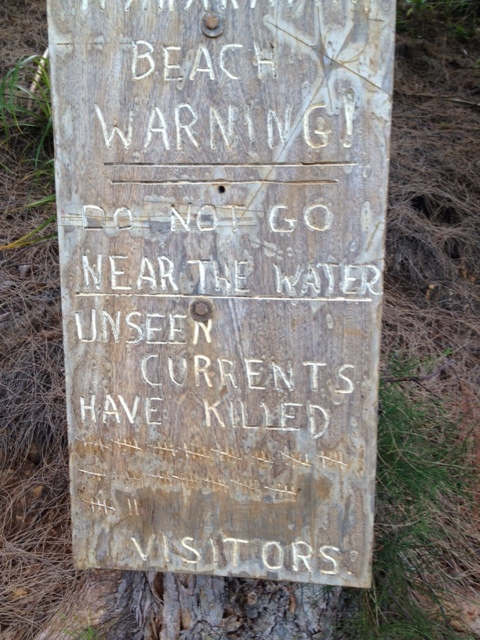 DO NOT GO NEAR THE WATER, UNSEEN CURRENTS HAVE KILLED (82 in Roman numerals) VISITORS. I noticed that there was plenty of room for more hash marks so . . . The trail cuts through the rainforest and crisscrosses the stream several times. An agile hiker could use the large rocks in the stream as ‘stepping stones’ for the many traverses that are required. I, on the other hand, had shoes and socks that were soaked by the time I reached the falls. And I’m sure a less-experienced hiker might lose this poorly marked and seldom traveled trail, but . . . OK, yes, I misplaced the trail a few times, but I told myself I was just being adventurous, not lost; the road less traveled and all that. I was less cavalier about losing the trail when I remembered that Jurassic Park was filmed around here and wondered if any of those creatures were still hanging out here. Instinctively my step quickened. As I was making my way back to the trail I came upon a fairly wide clearing in the otherwise thick foliage. I noticed a sign at the other end of the clearing and made my way over to see what it said. What?! 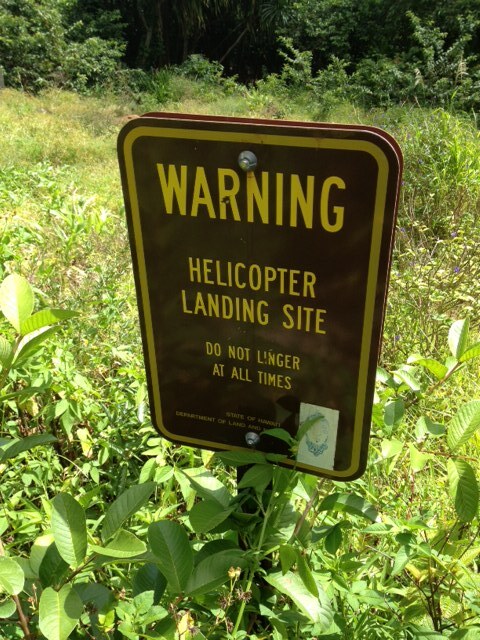 I could have taken a helicopter here?!! Don’t tell anyone, but I did ‘linger’ there for a while and thought that anyone coming to see the falls by helicopter would have missed the beautiful scenery along the way, and probably had very dry shoes and thus would not have appreciated the experience nearly as much as I did. Moving a little further up the trail, I reached the falls. The view was spectacular and well worth the four mile hike, OK, it was worth the eight mile hike since I was planning on making the return trip. The falls are several hundred feet high and cascade into a crystal clear pool, complete, as you can see in the photo, with nymphs, mythologically speaking. I included them in the picture to give a perspective of the size of the waterfall. The return trip was uneventful, although I think someone moved the rocks in the stream further apart. By the time I got back to the trailhead, my shoes were completely soaked, but my throat was quite dry, as I had run out of water on my return trip, so the young Hawaiian selling fresh coconuts filled with milk, complete with straw, at trails end, was a welcome sight. My shoes were not only soaked, but they were severely cut up from the lava rock, so no longer viable for hiking, but I wear them now when I work in the yard, and every time I look at them I think of this most beautiful hike. Nice true story Uncle Bobby! Makes me miss the islands! Thanks for sharing! Now can you share your marinade recipe for your special chicken legs & thighs? mmmmmmm! Bad Brad! 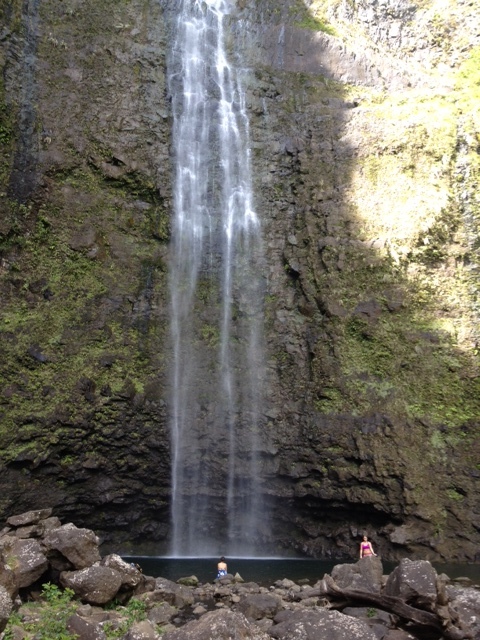 Thanks for great pictures of a beautiful place on the Island of Kaua’i. We love to visit the island and have been there before with my parents to see the place where my Dad was born. He was born on the Robinson Plantation in 1912 in the Territory of Hawaii. My grandfather had signed a 10 year sugar cutting contract with the plantation in order to leave the Madera Islands. We were fortunate enough to see the actual little house with outdoor brick oven where he was born. An 80 year old neighbor came over and we discovered that she had baby sat my Dad. What a trip that turned out to be. We are going back in October to visit the island again, but the long hike will not be on the agenda. The helicopter sounds like the way to go. Thanks again for the pictures. Great story Bob, thanks for sharing. Aloha!